Topic: Tinkering with a Lister - Now Painted! Up to your usual high standards Colin, I look forward to the next installment. Caught in a sandstorm - now I know why Ralph put that great big air filter on top of the bonnet..... I mean hood. Have you thought of adding breast pockets (patch style) to take a bit of the plainness off his front. Pockets could also be added on the thigh and his backside. Topic: The 13th ......but at least it's not a Friday! Yes the next meeting is on 13th February but don't let that put you off. OK then, I'll say nothing either. It's a pity we can't see the other side of the green loco above. I am intrigued by how they get the drive to the car differential unit. We weren't sure last night whether it was you with the flu or the cats. As Steve inferred you may have started a new trend. Think you'll need to shift the cab to the other side of the body for a UK machine. Look forward to seeing it on Wednesday. That's a good start you've made Carlo. The stub points are great and I love the loco. Yet another one who can't wait to see the layout finished. 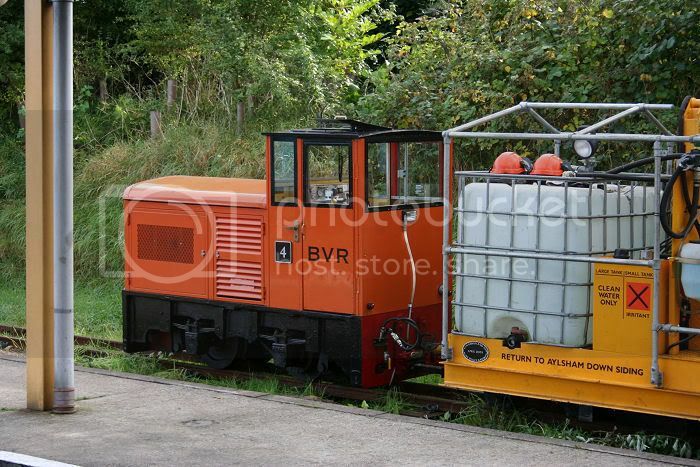 Topic: Which sounds for a 1-cylinder diesel loco? Very nice models, if that's your thing, but I'd much prefer a 1/24 grey fergy. Just in case anybody fancies making a model of this delightful little loco here is a shot of the other side taken 10th October 2005 at a Gala Day. Thanks for the answer about the wood Christoph. Just to keep things on an international footing I suppose I'd better use English Oak. That is one very nice figure and in a laid-back pose you seldom if ever see in a model. Excellent paint job. You can just imagine him sitting there spinning a good yarn. Not too sure about the size of the hammer though. On my photos of this loco it has 'Hunslet' on the axleboxes. Gnow that is what I call good track. This year (according to my boss) I will be in Nigeria, Tanzania, Uganda, Kenya, & The Sudan. Usual time and place courtesy of Ralph and Janet. Topic: A Grand Day Out!